With Spa Sentiments’ spider vein cream handy, you’ll be able to fight back against aging naturally. Caused by poor circulation, spider veins are the result of weakened circulatory valves that get clogged up with an excess amount of blood - primarily brought on by age, they can also be due to an increase in pressure to any part of the body. Dark, unsightly, and embarrassing, there’s only one thing to do when spider veins creep onto the scene . . . get rid of them . . . fast! Proven across the board to reduce the appearance of spider veins in as little as four to six weeks - no other name on the market can deliver such results - Spa Sentiments’ spider vein cream is the all-natural, completely safe alternative to any and all invasive surgery. Formulated for maximum skin absorption, Spa Sentiments’ spider vein cream with Vitamin K will have you swishing about town with a new heightened sense of confidence in no time flat. Spa Sentiments’ spider vein cream is the only high quality cream on the market that’ll have them on the run immediately after the very first application. And because Spa Sentiments’ has so much faith in their spider vein cream and it's ability to deliver stellar results, we guarantee a full refund after 120 days . . . even if you’ve used the whole jar! So if you or someone you know is suffering with an attack of unattractive spider veins, let Spa Sentiments’ spider vein cream extinguish them once and for all! - no risk whatsoever on your part! That is correct - use our spider vein cream for 4 months with zero risk. Have you ever asked someone "how to get rid of spider veins"? Well, you are not alone. Many women as well as men are looking for a spider vein solution that really works. Some look to surgical methods, others to injections. For those who are looking for a non-invasive alternative, Vein Renew may be just what you are looking for. Vein Renew spider vein cream can be used successfully on all skin types. It can be applied practically anywhere spider veins occur. Of course, as with all body and face creams, you will want to avoid contact with the eyes. Is this a "miracle" solution? No. The "bad" news is that - there is no such thing as a "miracle" product. The "good" news is that Vein Renew spider vein cream can help to reduce the appearance of your spider veins when used as directed. You can expect to see an improvement in your spider veins in 60 to 120 days (or sooner). This product is guaranteed to provide results and comes with a 120 day "use it to the bottom of the jar" money back guarantee. Why does this spider vein cream work better than others? Vein Renew is not just a moisturizer, it is formulated using high-quality, pharmaceutical grade ingredients known for their ability to address spider vein reduction. We also utilize a dual delivery system designed to deeply penetrate the skin to help reduce the appearance of spider veins in as little as a 4 to 6 weeks. In addition, our cream contains a dual delivery system of both emu oil and liposomes to help make it even more effective. Using our spider vein cream twice daily, allow 60 to 120 days to see improvement. Severe Spider Veins: Depending on the severity on your spider veins, more time may be required to see substantial results. However, there should be some indication of overall improvement within 90 to 120 days even in regards to more severe spider veins. The longer the cream is used, the better the results. My skin is very sensitive. Is this cream hypoallergenic? Our spider vein cream is non-comodogenic (will not clog pores), non-irritating and bacteriostatic (does not promote bacterial growth). It is a very effective but gentle cream. Apply the spider vein cream twice daily, morning and evening. Our spider vein cream is highly concentrated so a small amount goes a long way. More is not necessarily better. The brochure included with each order will explain specifically the amount to use. Why is this spider vein cream more expensive than the other creams? Vein Renew is not just a simple moisturizing cream with Vitamin K added. Any formula is only as good as the ingredients it contains, the percentage of each key ingredient it contains and the way in which the ingredients are delicately and precisely combined together. Our spider vein cream isn't diluted with water making it highly concentrated. In fact, no water is added to our formula -- so a little goes a long way. We use pure Aloe Vera instead of water. You use about half the amount as you would with some other creams on the market. How does Vein Renew Spider Vein Cream help? Vein Renew spider vein cream penetrates through the epidermis (the top skin layer) down into the dermis (the second layer) where the special ingredients (like the pharmaceutical grade Vitamin K) go to work helping reduce the appearance of spider veins from the inside - - - out. Spider veins are small bluish, purplish, or reddish dilated (and/or broken) capillaries just below the surface of the skin (usually occurring on the legs or face). They often appear as a cluster with tiny veins radiating out from a centralized area -- resembling the legs of a spider. No one seems to know for sure what causes spider veins exactly, but there are several factors that cause a person to be more likely to develop them. Heredity (or being born with weak veins or valves) seems to be the greatest factor. Hormones may also play a role during puberty, pregnancy or menopause. Aging, obesity, leg injury or prolonged standing may cause spider veins. Sun exposure may also cause spider veins to appear on fair-skinned people. Medication such as estrogen, progesterone and birth control pills may cause spider veins to develop. Although some people are more susceptible to spider veins, anyone can get them including men. Vein Renew is not just a simple moisturizing cream with Vitamin K added. If you compare our ingredients to any other cream on the market, you will see that our cream is quite different. Most other creams contain water as their very first ingredient, which means water is their main ingredient. Our ingredients alone (in our cream) blow most all other creams out of the water. In addition, our cream contains a delivery system of highly concentrated emu oil to help make it even more effective. Ingredients in Vein Renew are: Aloe barbadensis (aloe vera juice),emulsifying wax, glycerin, aloe barbadensis (aloe butter), butyrospermum parkii (shea butter), vitamin k, cetyl alcohol, steric acid, salix nigra (black willow bark extract), emu oil, simmondsia chinensis (jojoba oil), hellianthus annuus (sunflower oil), panthenol, hyaluronic acid, camellia sinensis (green tea extract), tocopherol (vitamin e),germall plus. In addition, our spider vein cream does not contain any dyes or bleaches so the "caramel" like coloring occurs naturally due to the high amounts of extracts it contains. Our formula isn't diluted with water (or any other fillers) making it highly concentrated. In fact, no water is added to our formula -- so a little goes a long way. We use pure Aloe Vera instead of water. You use about half the amount as you would with some other creams on the market. The following descriptions are not the opinion of our Company, Vein Renew, nor any person employed by the above. The information was compiled from data provided freely from the Cosmetics Industry. The information below is not intended for use to prevent, treat or cure any diseases. Vitamin K: (Pharmaceutical Grade) Reportedly helps to reduce the appearance of spider veins as well as having other skin nourishing benefits. Hyaluronic Acid: Helps regulate the moisture balance of the skin and has a high capacity to retain moisture. It forms a highly moisture retaining film which still allows the skin to breath while helping make the skin more smooth and supple. Glycerin: Helps soften and attract moisture to the skin keeping it moist and soft. Green Tea Extract: A powerful antioxidant said to have the ability to protect the skin from environmental stress and pollution. It may also help combat premature aging and wrinkles. Vein Renew can be applied anywhere spider veins may be a problem. It is guaranteed to work for you. Send us your success story and receive a 10% discount on all future orders of Vein Renew Cream. Did you know it's illegal to use false testimonials? Here are just a few of the testimonials from real satisfied users of our Spider Vein Cream. I have been using Vein Renew spider vein cream for about 4 weeks and have noticed wonderful results already. My spider veins have faded dramatically. I was so impressed that today, I ordered stretch renew stretch mark cream and the curves and contours cellulite therapy. I have confidence that these treatments will work as well as my Vein Renew. I wish I would have found these products years ago! Thank You. I have tried many types of Vitamin K creams and vein creams and your Vein Renew Spider Vein Cream is the BEST. My spider veins have improved tremendously. I am sure if I continue using it, they will be even better. Thanks so much. I worked in retail for over 20 years, causing numerous spider veins to appear on my legs. In addition, I have very light, almost transparent skin, which really shows all marks. After using only one jar of Vein Renew spider vein cream I could see a real difference in my legs. 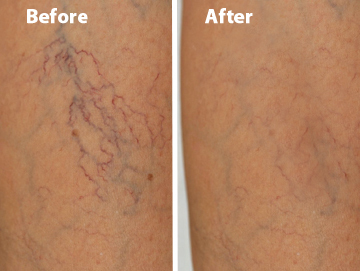 I would concentrate the cream on certain trouble spots, and after only a few weeks, most of the previously visible spider veins had almost disappeared! I was very impressed with the Vein Renew spider vein cream. I have used a number of creams before with no success and I admit I was a bit skeptical when I didn't see much change after finishing the first jar of Vein Renew. But after starting the second jar, I was convinced it was working. My spider veins on my legs are not gone yet, but are diminishing rapidly. I am certain they will vanish completely with continued use of your cream. I have been using Vein Renew spider vein cream for about 4 weeks and I am ready to reorder. Why? Because I already see a difference. I have had 2 patches of spider veins on my legs for more years than I care to admit. I have tried other products and creams, but never got results--not even improvement. However, now I see these spider veins fading. I will be reordering soon. I had spider veins on my face from rosacea. Vein Renew diminished them within 60 days and now the veins are almost gone. When medications and prescription creams couldn't help, your spider vein cream did what others couldn't. Thanks Vein Renew. I have only been using your Vein Renew spider vein cream for a short time and I have been so happy with the results, I decided to let you know. I have tried many different kinds of spider vein creams over the last three years. Some have worked better than others, but none have matched the results of your cream. In just a short period of time, I have already noticed some veins have completely disappeared (these were newer veins). I have a couple of veins that are about 10 years old. They have faded somewhat with other creams, but your Vein Renew cream has lightened up the redness at least 50% and in one area of the vein, it has completely disappeared. I have decided not to buy anymore of the other creams that I use. From now on, I will exclusively use your Vein Renew Spider Vein Cream. I ordered vein renew spider vein cream a few weeks ago and although it has not been that long, I can see a difference in the veins. They are slowly fading. I am sure with continued use, my veins will completely fade away. I also love the way it feels on the skin. Vein renew is a great cream and actually does work. It has only been two weeks...but for this short amount of a time, there has been improvement. I love the cream and will order more because I need it. I never thought I could actually find something that would get rid of the ugly veins on my thighs and legs. Thank you so much. I am also interested in your stretch mark cream and plan to order. If your company makes it, it most likely works. I purchased vein renew spider vein cream in mid April and have been using it faithfully everyday for about 5 or 6 weeks now. I still have a few areas of small spider veins, but I am already impressed with my results. I have noticed the overall color of my legs is more even. Also, if I get a bruise, it is gone in a couple of days with no evidence it had been there. I am already impressed with the overall look and feel of my legs and plan on continuing to use your cream until I achieve maximum results. Thank you so much for your product! I recently received my order which is Vein Renew Spider Vein Cream. After I tried it on my face only 10 days, I found amazing results from your cream. I am a 42 year old woman. I considered myself and was considered also by others to have nice legs. But after the years of working and having a child, my legs are spotted with spider veins on my thighs, front and back. I am just finishing my second jar of the Vein Renew spider vein cream. Of course, after a week or so I was looking at my legs thinking something would happen right away and when I saw no change I was getting discouraged. It has now been a full month and I'm excited. I see a change. The veins are not so purple and they are getting lighter. I'm hoping the progress will continue. I have tried many spider vein creams and I want to tell you that yours worked the best for me. My condition is pretty bad and I am sure that no cream will give perfect results, but yours did fade them significantly. I am sure it will continue to help more as I use it in the future. Thank you for your good service. I bought my first jar of Vein Renew Cream a few months ago to use on the rosacea on my face. I wasn't really sure this cream would work on my face, but I tried it anyway because I had so many tiny red lines across the bridge of my nose and on my cheeks. Well, it does work and I love the feel of the rich cream on my skin. I had trouble the first time I tried to contact your company, but when I went to reorder today I found a way to let you know that I do love your spider vein cream. Thank you. I have purchased the spider vein cream. It works great! Thanks! I ordered 2 jars of the Vein Renew Spider Vein Cream the middle of May. I had spider veins really bad on both of my legs. By the time I went on vacation in June (several weeks later), I was not ashamed to wear shorts. My veins were not gone but they were so much lighter. Thank you. I really like your vein renew spider vein cream. I have been using it on my upper left leg for about two months now and I have seen great improvement. I will continue using your cream until the spider veins are all gone. Thank you for such a wonderful product. Keep up the good work.